The essential games to take out for a spin on your new iPad Air. Want to grab some top-quality racing games for your new iPad Air? Here's our pick of the very best racing games available from the App Store. You'll need sharp reflexes in this drag-racing game that owes more than a little to the chart-topping CSR Racing. Still, there's a very generous selection of upgrades to work towards, and keep you coming back for just one more race. A worthy addition to any iPad Air. If it's ridiculously over-sized vehicles - rather than sleek and fragile supercars - that really tickle your fancy, make sure you grab Offroad Legends as soon as you get home from the Apple Store. A generous collection of 4x4s, off-road titans, and monster-trucks are just waiting for you to take them for a spin. It's all about careful handling in this mobile game from the creators of the formidable Trials games. There's time pressure to take into consideration as well though - so make sure those fingers are nimble as well as accurate in this top title from RedLynx. Most of the games in our list keep their tires firmly on the road, so for something a little different we heartily recommend picking up Riptide GP2 for your iPad Air. This water-based racer features great course design, gorgeous graphcis, and some seriously satisfying handling. A great game to round out your racing collection with. 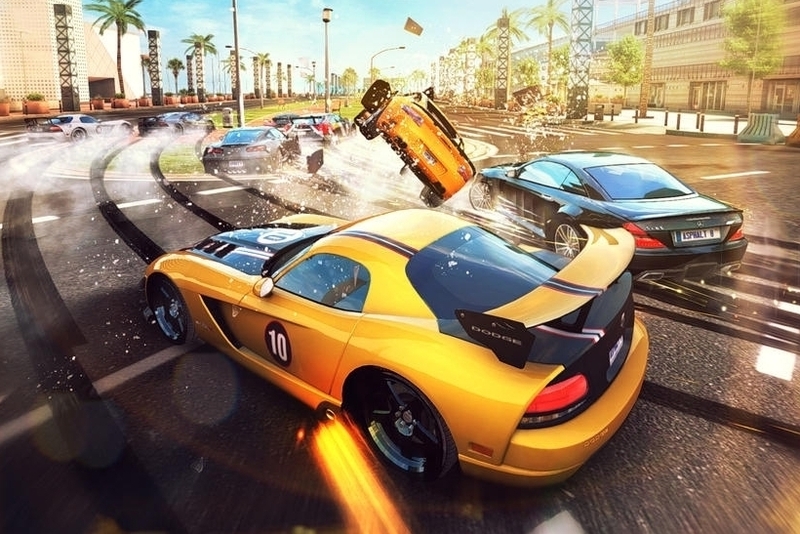 The Need For Speed games have made appearances on mobiles with varying degrees of success. For our money, Most Wanted is the pinnacle of the series as far as mobile phones and tablets are concerned. Keep an eye out for a sale, or simply grab the game at full price. Either way, this is one racing game you definitely want installed on your iPad Air. When it comes to looks, Hill Climb Racing is the most primitive game in our round-up today, but you really can't beat it for one-more-go gameplay. The developers have kept plenty of new content coming for this free-to-play title, and we think everyone should take it out for a spin at least once. Those who prefer to pay once for their games will probably want to give CSR Racing a miss, but if you don't mind a fairly imposing freemium model, CSR still offers up one of the best drag-racing experiences you can get for your iPad Air. Bring nerves and reflexes of steel if you want to master this tense, gear-switching gameplay. Fast & Furious 6 achieves a very rare honor for a mobile game. Released essentially in order promote a new film, this tie-in actually delivers on gameplay. It won't be to every racer's tastes but we don't hesitate to recommend downloading this free title to your new iPad. If a better racing game than Asphalt 8 comes along in 2013, we'll be both pleased and surprised! The game's frequently available for free on the App Store, but even if you miss a sale this is one dollar that simply can't be spent any better. This arcade racer will absolutely blow your socks off, guaranteed!